As Chief Minister Arvind Kejriwal and his cabinet colleagues’ sit-in at the LG office enters the seventh day, a petition has been filed in the Delhi High Court seeking direction to the Lieutenant Governor (LG) to ensure that the informal strike by the IAS officers is called off and they are told to attend meetings with the Delhi ministers so that public works are not affected. Advocate and social activist Umesh Gupta has moved the high court stressing that the informal strike by the IAS officers posted in the Delhi government has brought the urgent public works to grinding halt. High Court has agreed to hear the petition on Monday. 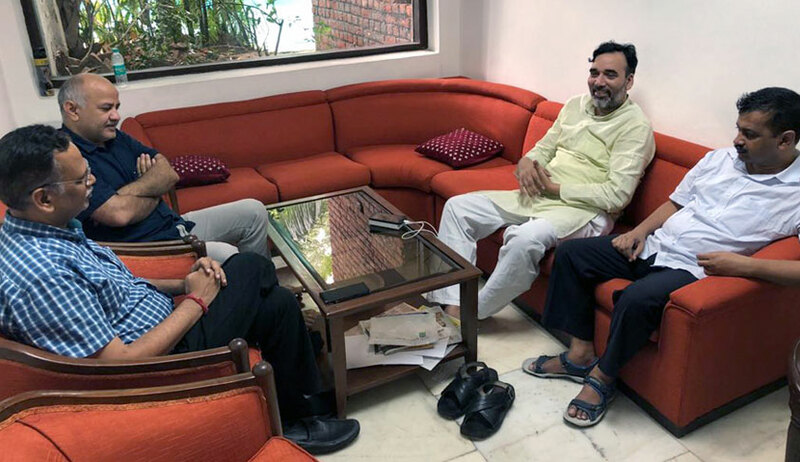 He sought direction to the LG that the informal strike by IAS officers in the Delhi government is called off and that they perform their official functions as public servants. The petitioner also prayed that strict action be taken against the IAS officers for violating Central Civil Services (Conduct) Rules which prohibit officers from going on strike. The instant petition by Umesh Gupta closely follows a petition by another advocate Hari Nath Ram praying that the sit-in protest by Kejriwal and his cabinet colleagues at the Raj Niwas be declared illegal and unconstitutional as it has brought the government machinery to a standstill. In the instant petition, the petitioner said it was clear from media reports and several letter in public domain that over the past three-four months, despite the best efforts of the ministers in Delhi government, the IAS officers serving in the Delhi government, especially the senior officers holding key departments, have been openly refusing to attend meetings called by the ministers for urgent public works. This, he said, has slowed down urgent public work and issues of preparation for prevention of monsoon-related illness, mohalla clinics, pollution, along with other public works which require urgent attention and seamless coordination between the cabinet ministers as well as the IAS officers. He also relied on a letter written by Chief Minister Arvind Kejriwal and Deputy Chief Minister Manish Sisodia to the LG in February explaining him the gravity of situation asking him to intervene but the LG did not take any formal action. The petition said such conduct of the IAS officers is in clear violation of Central Civil Conduct Rules which provide that no government servant shall resort to or in any way abet any form of strike or coercion or physical duress in connection with any matter pertaining to his service or the service of any other government servant. The petition also cites Supreme Court judgment in TK Rangarajan v State of Tamil Nadu wherein it was held that public servants must resist from carrying out strikes or actions that hamper the performance of their official duties because government servants are part and parcel of the governing body and owe a duty to the society. It is to be noted that the apex court has held that strike cannot be used as a weapon by government employees to hold society at ransom.